Grease a tart tin with nonstick spray and sprinkle with flour. Cream the butter with the sugar. To this, add the eggs and flour and mix well. Spread the mixture into the tart tin and bake for about 20 minutes at 350 degrees or until the center looks spongy and is golden. Remove from the oven and set aside. 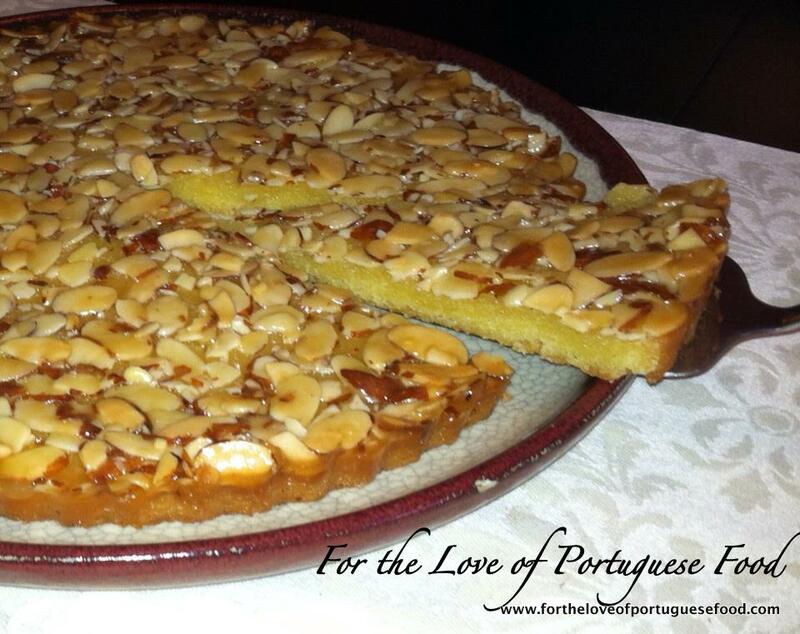 Mix the sugar, butter, milk and almond slices in a sauce pan. Heat the mixture up until it starts to boil and turns into an opaque tan color. Spread the topping over the cooked dough and return to the oven. Bake at 350 degrees for at least 10 minutes or until it turns a golden brown color and the topping is no longer bubbling. Allow to cool before serving. Heat olive oil and butter in frying pan. Then add minced garlic. Let garlic fry in pan for a couple of minutes then add the shrimp. Fry a few minutes and then add lemon juice. After 5 minutes or so, add the Goya seasoning and beer. Let the shrimp simmer until it is cooked and until the sauce thickens. Remove shrimp and sauce from frying pan and toss chopped parsley on top. Serve and an appetizer or serve with rice or spaghetti to make a meal out of it. Also, I usually omit the butter and it comes out just as good! In a medium saucepan, heat the olive oil and add the sausage. Cook until slightly browned. Add the onion, garlic and bay leaf until onion is translucent and soft. Add the tomato paste and mix well into other ingredients. Next add the beer. Bring to a quick boil and then add the water. Allow to simmer for about 30 minutes uncovered. Add the frozen fava beans and again bring to a boil. Add salt and pepper to taste and hot crushed peppers. Cover saucepan and allow to simmer on low / medium heat until the fava beans are cooked, and the sauce is starts to thicken. If at any time, the sauce starts to dry out too much, simply add a little more water. For me the fava beans taste best is they are allowed to simmer on low for a long period of time – normally between one to two hours. Beat the egg whites until soft peaks form. Then add the sugar, one tablespoon at a time and continue to beat until mixture forms stiff peaks. Add lemon juice. Line a baking sheet with foil or wax paper and add non-stick spray or coat with butter. Drop merengue mixture by spoonfuls one by one onto baking sheet. Allow enough space between each as they will grow as they bake. 1. In a medium pot add the olive oil, bay leaf and linguica. Once the fat is rendered and the linguica slices start to look a little browned, add the onion and garlic. 2. When the onion becomes translucent, add the tomato paste and mix well with a wooden spoon and add the water. 3. Bring the water to the boil, add the salt and let the ingredients simmer until the sauce starts to thicken a bit, approx 30 minutes. 4. Add the beans and cook over low heat for 45 minutes. If the sauce dries out too much, you can add a little more water. Also, you can add hot sauce for additional flavor.